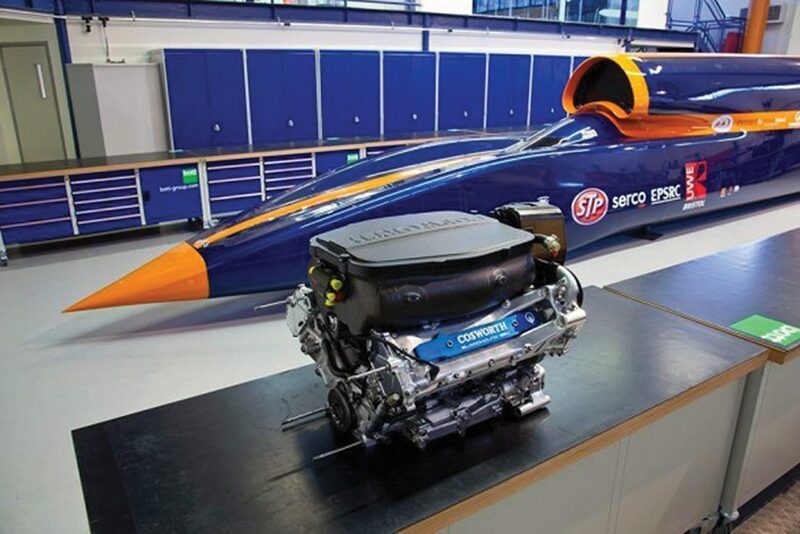 Bloodhound, the British 1000 mph jet and rocket-powered land speed record challenger, is planning to convert at least one of its most important functions to electric power – if a suitable technical partner can be found. The project’s technical director, Mark Chapman, announced a plan to use a 600 bhp electric motor to power Bloodhound’s all-important fuel pump, whose job to deliver one tonne of peroxide catalyst to Bloodhound’s Nammo rocket motors in the 18-seconds it takes for a 1000 mph record run. At present, the car has a supercharged Jaguar V8 to pump fuel, but Chapman believes electric power would provide a much greater packaging flexibility. One possible partner could be the Chinese car company Geely, an existing Bloodhound sponsor, which owns the Swedish Volvo brand and recently announced a 600 bhp electrified powertrain for its Polestar performance offshoot. Talks are proceeding. Recently Bloodhound cleared the first of many performance hurdles by completing 200 mph test runs on the 1.2 mile runway at Cornwall Airport, Newquay. The first day’s shakedown, conducted on the ninth anniversary of the project’s inauguration, consisted of two noisy and spectacular runs at 220 mph and 210 mph in full view of sponsors, supporters and press. At the wheel was Wing Commander Andy Green, already the world’s fastest man, having set the world’s first and only supersonic record of 763,035 mph on the Black Rock Desert, Nevada, in Bloodhound’s predecessor, Thrust SSC, 20 years ago. The Bloodhound project’s director Richard Noble, himself a former land speed record holder, gave further details of Bloodhound’s record-breaking timetable as it moves towards 1000 mph, a speed he describes as “the limit of current technical capability”. The car will run “very fast” next year, probably to about 650 mph on jet power alone, then will attempt to better Green’s existing record in 2019, and, if successful, will bid for the full 1000 mph in 2020. Bloodhound insiders aren’t yet saying where next year’s “fast” runs will take place. Their preference is for the specially prepared 12-mile track at Hakskeenpan in South Africa, but weather (and possibly the demands of sponsorship) may see the car run elsewhere in the world.